Hi it’s Tanya from the Trey & Lucy Blog!I am so excited to be here today. Kari has one of my very favorite blogs!I have a blog all about crafting, sewing, turning the old into new, being a mom, and my kids. A few weeks ago I did a tutorial on how to make button earrings. I needed a place to keep them. Come along and I’ll show you how to make them. 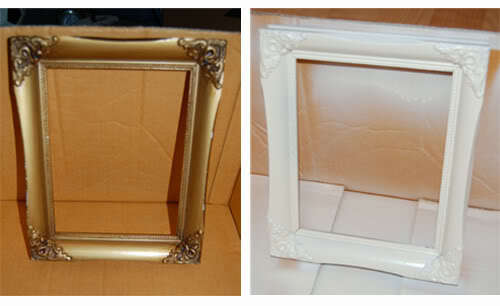 Spray paint a old vintage frame antique white. You can get the frames a places like goodwill. They have antique white spray paint everywhere. 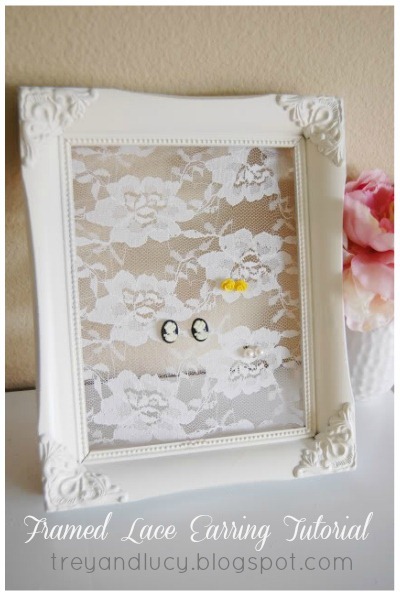 Take some vintage looking lace and lay it on top of your frame. I got my lace at JoAnns. 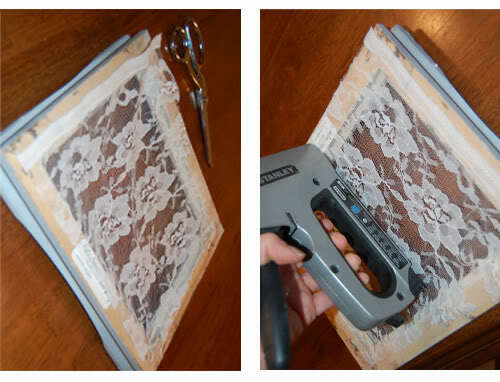 Cut your lace out to the size of your frame. 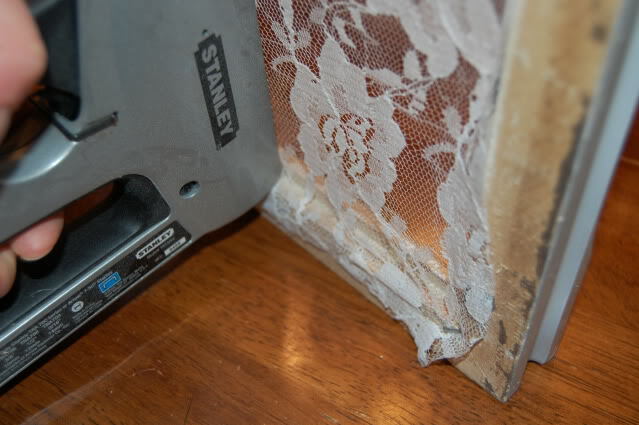 While pulling your lace taut, staple your lace to the back of your frame. Staple from side to side, and corner to corner. After it’s stapled all the way around, hold your frame on it’s side and staple down toward the edges of the frame. Do this all the way around the inside of the frame. 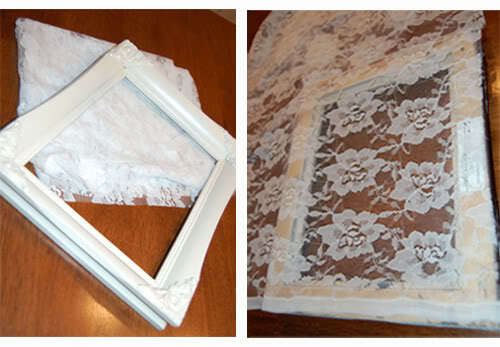 This makes the lace come forward in the frame and make the lace a little more taut. 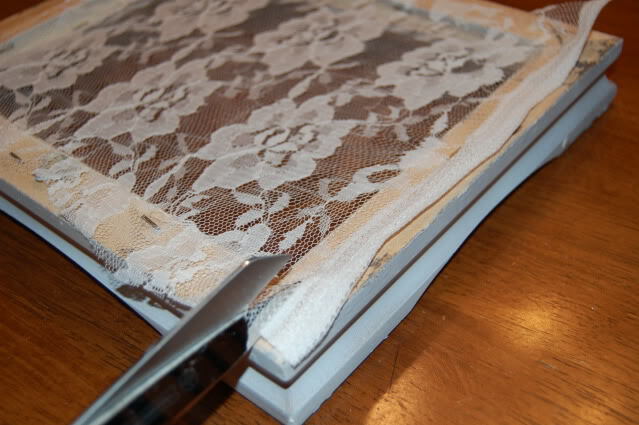 Cut off your access lace and your done! Thank you so much Kari for letting me stop by for the day! Come visit me at Trey & Lucy anytime! what a wonderful idea – i hate keeping my jewelry all put away where i can’t see it! That’s a brilliant idea. An easy project too. I love it. LOVE it , I’m going to try it. Love this idea!!! Great post! Its so pretty and a great way to sore earings! I have never seen this done with lace before, but it is so beautiful. Thanks for the inspiration. Happy Easter. Love & blessings from NC! This is so beautiful. I like it much better than my current earring holder. Thanks for the inspiration. What a fantastic idea!! Thanks so much for sharing! Perfect idea for my daughter’s room! I have been wanting to redo an old frame that I have. This will be perfect. Thanks for the idea!! 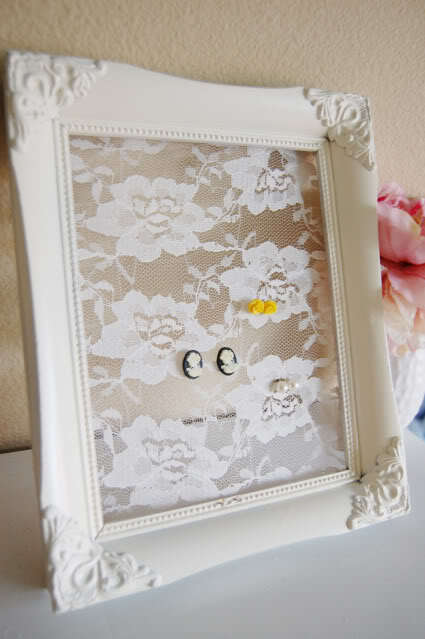 I think that’s the easiest handmade earring holder I have ever seen. It’s perfect! That is so pretty! I love the lace. Thanks so much to both of you, I’ll be linking. 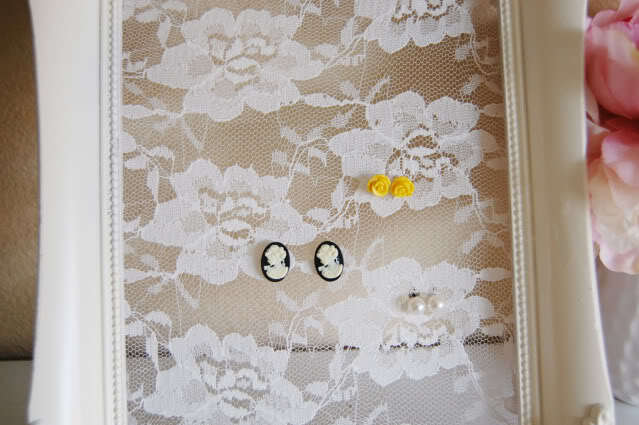 A friend of mine has something similar to this, but not with lace…I LOVE the lace! I am going to have to make myself one of these. I love this idea. It is beautiful and simple. So cool.I’m definitely going to make some of those for a craft show sometime. Just made it. Love it. Woderful idea.. Just loved it..
Great idea, just what I was looking for. Thanks!